This week just happens to be National Picnic Week and as you’ve probably realised by now, I’m a big fan of outdoor eating. 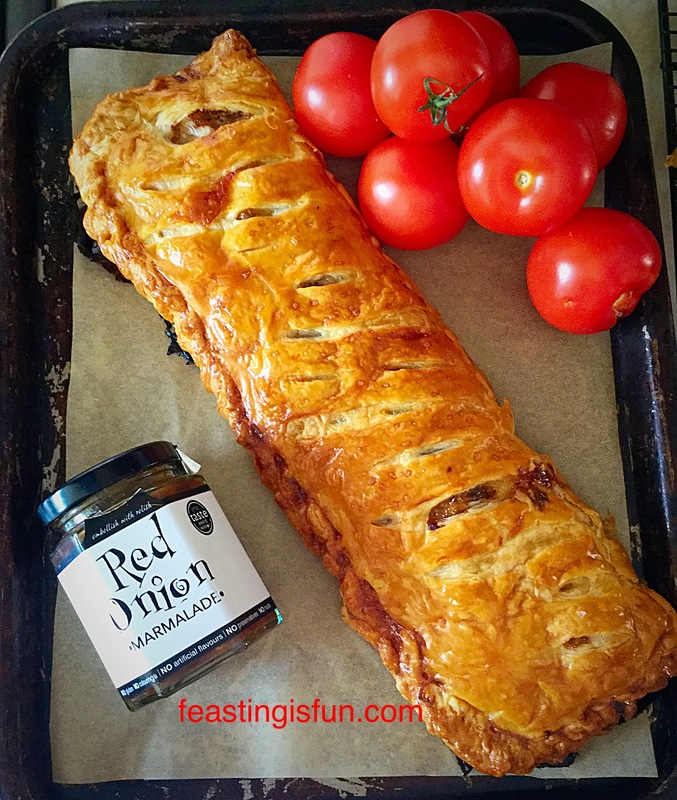 My Red Onion Sausage Plait is perfect for picnics and many other meals too. 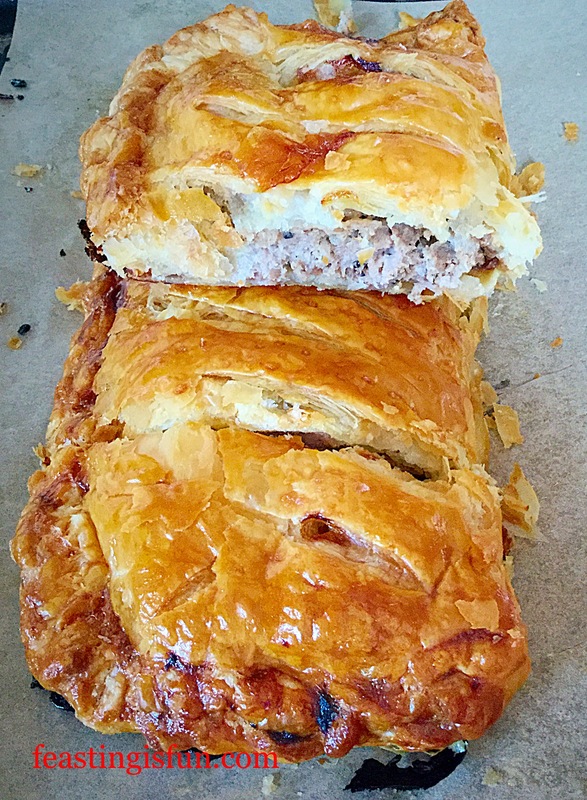 Great quality sausage meat mixed with red onion marmalade, encased in golden, all butter puff pastry. Utterly delicious. 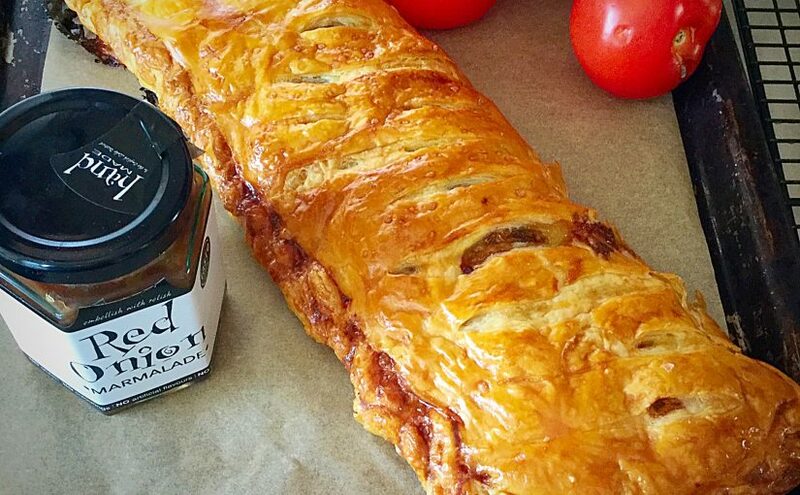 Red Onion Sausage Plait full of flavour and texture. The very nice people at Hawkshead Relish sent me some savoury relishes and marmalade to try out. I am a huge chutney fan – everything from jellies, to chutneys, relishes and marmalades. For this review, however, I wanted to use them as ingredients and see just how well they worked being in a dish as opposed to being spooned onto the side of a plate. I have actually made this Red Onion Sausage Plait twice. Unfortunately I wasn’t able to get good pictures the first time round. Nobody in our house was upset that I had to make this again. 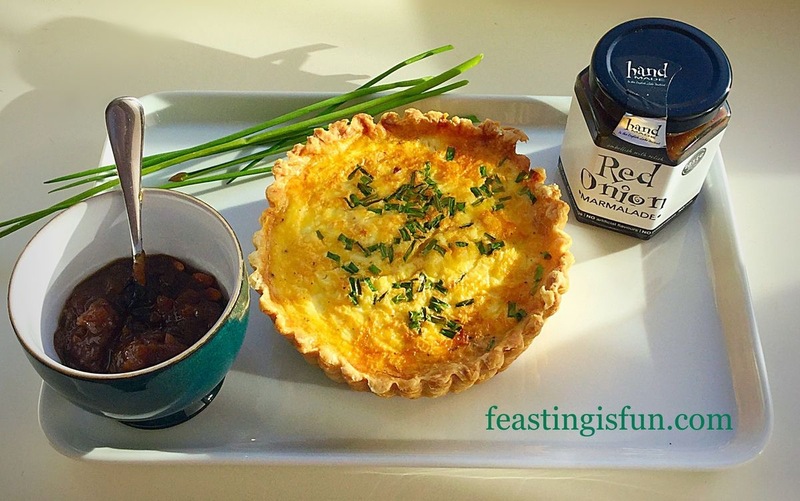 We all loved the flavour and added texture from the red onion marmalade that contains raisins and crunchy pine kernels. Red Onion Sausage Plait, juicy, crispy with incredible flavour. So I set about making another Red Onion Sausage Plait, a little heavy hearted. I love, I mean absolutely, completely, adore this Red Onion Marmalade and I knew this would use the last of it. Still I cheered myself with the fact that it makes such a knockout recipe and that I’d be eating it for dinner! 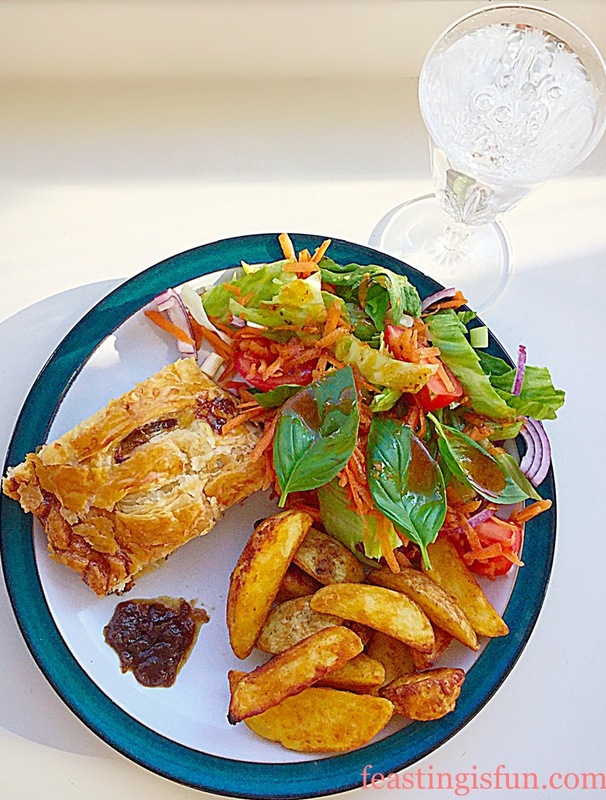 Red Onion Sausage Plait also great as a mid week meal with salad and potato wedges. Warmed and served with a huge pile of salad and some potato wedges that I had in the freezer, this Red Onion Sausage Plait really does make a tasty, weekday meal. It’s easily made ahead uncooked, wrapped in cling film and kept in the fridge until dinner time. It only takes 40 minutes to cook, which I why, seeing as the oven was already on I whacked in some potato wedges from the freezer. The huge bowl of salad I made to accompany the meal also had thinly sliced red onions in it which echoed the flavours in the sausage plait. 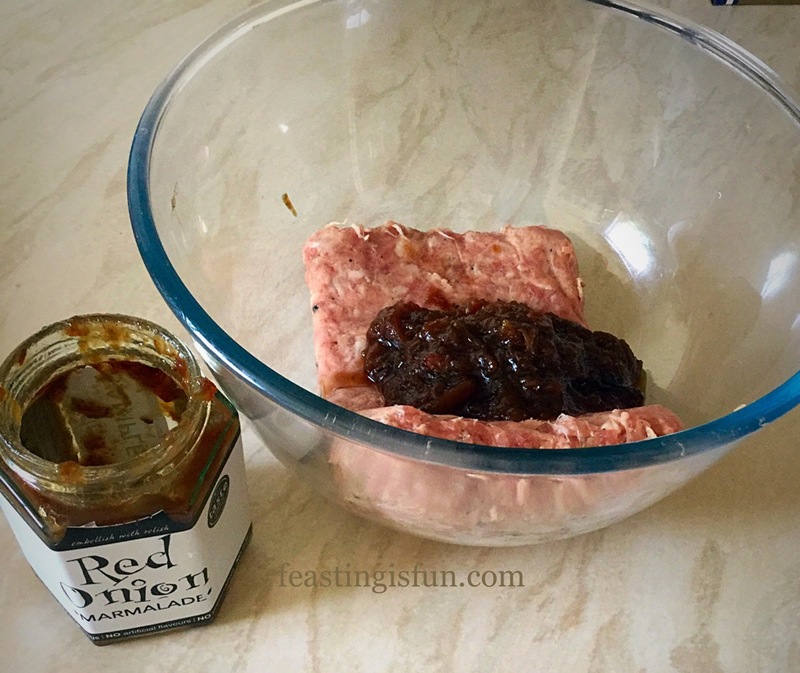 The caramelised onion flavour works so well with the meaty pork sausage. This is definitely a firm, family favourite now. I look forward to eating this Red Onion Sausage Plait on picnics and for dinner many times in future. Place the sausage meat in a bowl with the red onion marmalade. I enjoyed smooshing the mixture together with my hands! Using a clean hand smoosh the mixture together, through your fingers, until it is fully combined. Set to one side and wash your hands. On a clean work top unwrap the pastry sheet. 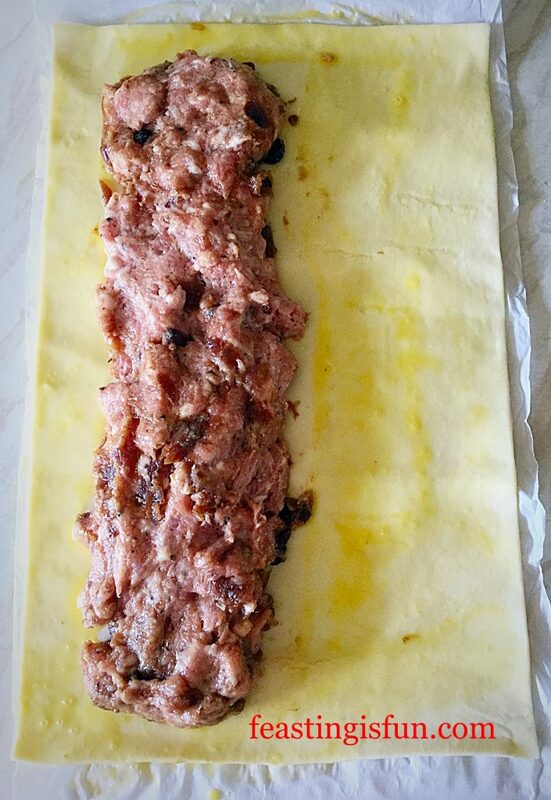 Place the sausage meat mixture down one side of the pastry, rather like a huge sausage roll, leaving a gap at each end and the side of at least 2.5cm. 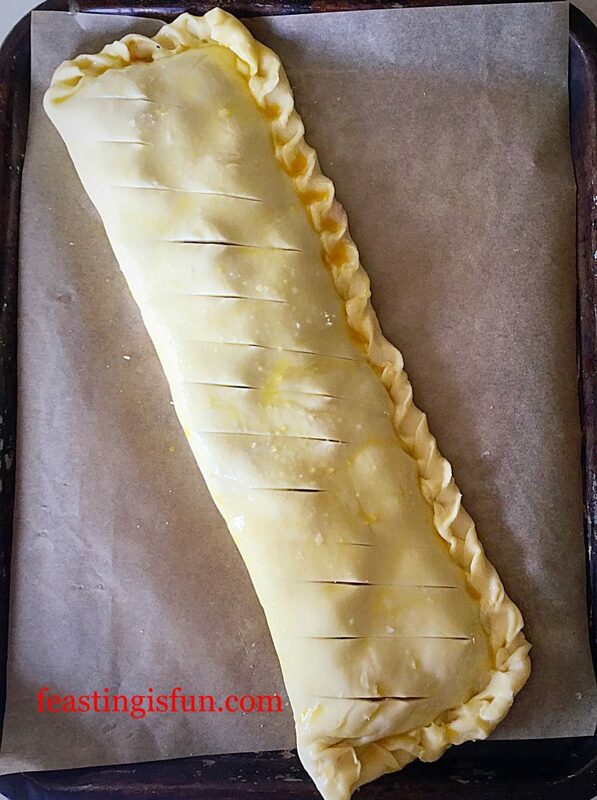 The right side of the pastry will fold over the sausage meat. Crack the egg into a small bowl and whisk with a fork until well mixed – egg wash.
Dip a pastry brushing into the egg wash and brush all of the visible pastry (not the sausage meat) with egg wash.
Bring the right side of the pastry over the sausage meat so that both side edges are together. 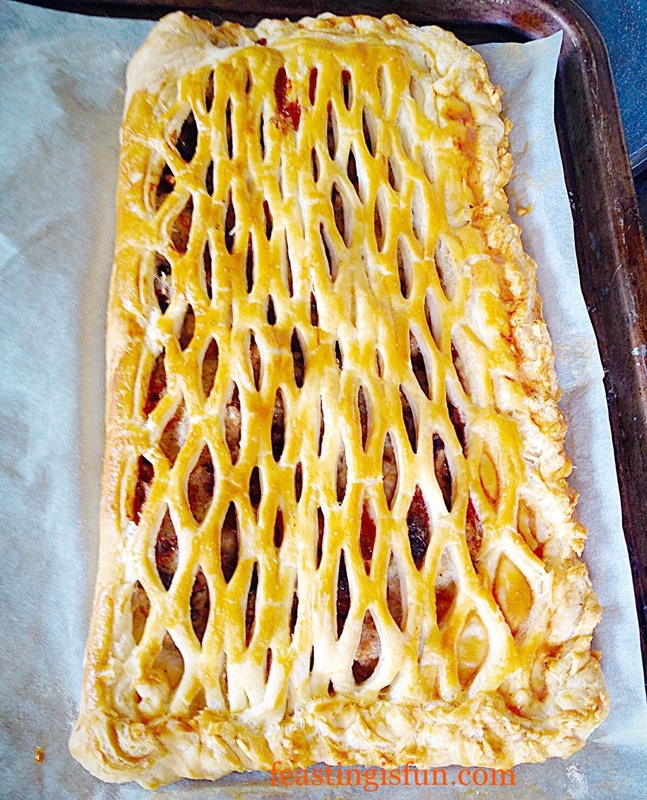 Crimp with a fork or twist all the way around where the pastry layers overlap to seal them. 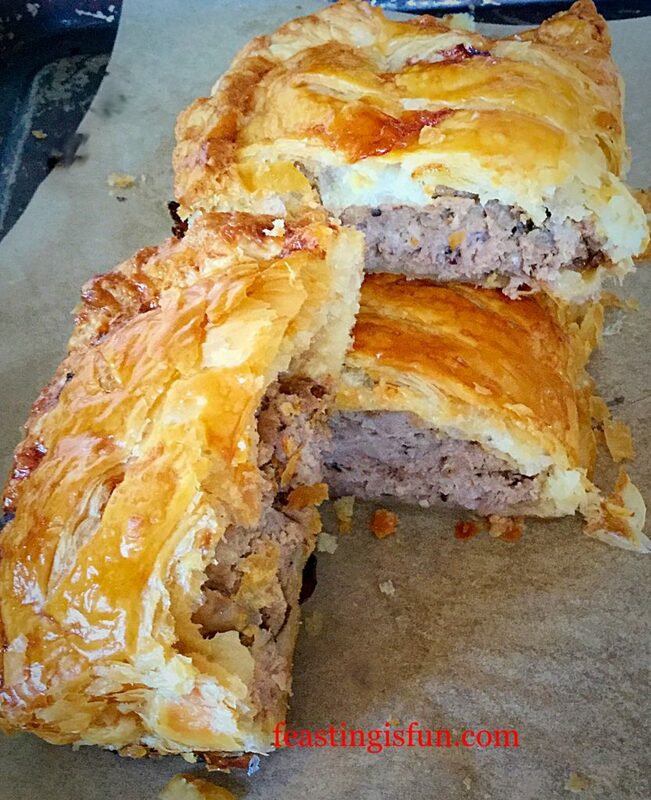 Transfer the Red Onion Sausage Plait to the baking tray – mine would only fit on at an angle! 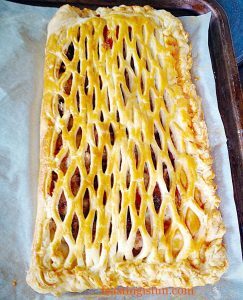 Brush over the entire outside of the sausage plait with egg wash. Finally sprinkle with a little sea salt. Red onion Sausage Plait with diagonal slits. Using a sharp knife cut light diagonal slits through the pastry. This allows steam to escape and enhances the look of the finished bake. 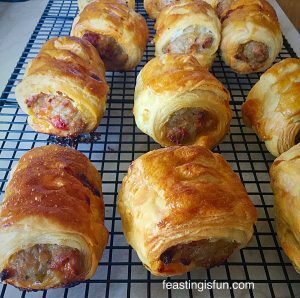 If not baking straight away, wrap the entire tray and sausage plait in cling film and store in the fridge – ideally it should be baked within 24 hours. If baking straight away, place the baking tray in the middle of the hot oven and bake for 40-45 minutes. The sausage plait should be a deep golden colour and any juices should run clear – if in any doubt slice a portion off of the end and check. There should be no pinkness to the sausage meat – if there is pop back into the oven for 15 minutes and reduce the heat by 20C. Once baked remove the Red Onion Sausage Plait from the oven and leave to cool slightly on the tray. To serve, allow the Red Onion Sausage Plait to cool for at least 15 minutes, longer if possible. 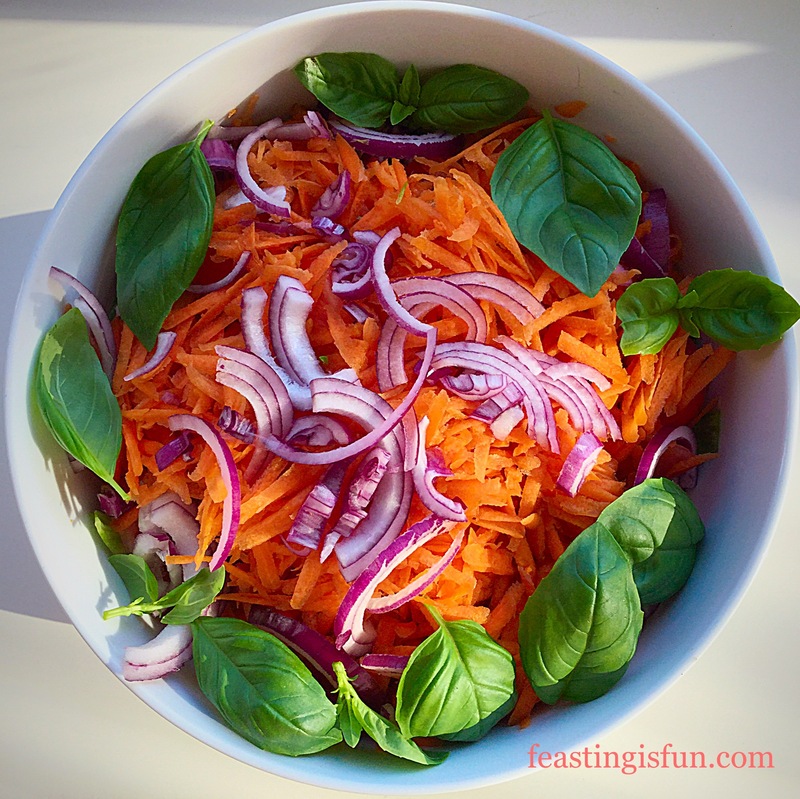 Slice into portions and serve with salad, new potatoes, or for ease potato wedges. Golden pastry and sausage meat with caremelised red onion. To store and for packing up for a picnic, allow the sausage plait to cool. Cut into slices – I find a serrated knife is best when it’s cold. Pack the slices into an airtight container, or wrap in cling film. Store in the fridge for up to 3 days. Delighfully savoury and full of texture, slices of this Red Onion Sausage Plait also make a welcome change to packed lunches! Feta Red Onion Marmalade Quiche. Using the Red Onion Marmalade as an ingredient, rather than just as a condiment, has opened up a whole world full of flavours. I have so many more ides, from pasta dishes to soups, stews and a million more. Do you ever use condiments in your cooking? Let me know in the comments section. I’m always interested to here and learn about new recipes and cooking methods. Whatever you are cooking up in your kitchen, have fun preparing your feast! Hawkshead Relish provided me with a sample jar of their red onion marmalade. All views and opinions are my own. All content, recipes and photographs are my own and covered by copyright law of the land. Please see my Disclosure Policy. I wish pork didn’t give me migraines. This looks amazing! This looks so delicious. I’m definitely having it this weekend. I have some Vidalia onion marmalade, it’s not the red onion but I love Vidalia’s so I will use that. You have the perfect accompiments. I can’t wait to share this with my daughter and her husband. They will love it. The only condiment I would use might be a little Maille Whole Grain Dijon Mustard. I added that to my Peasant’s Beef Wellington.